Anthony Himmelberger ’19 and Hannah Corney ’18, a fifth-year graduate student in GIS at Clark, show baby loggerhead turtles from Rookery Bay in Florida. Corney visited Himmelberger, who interned at Rookery Bay National Estuarine Research Reserve. 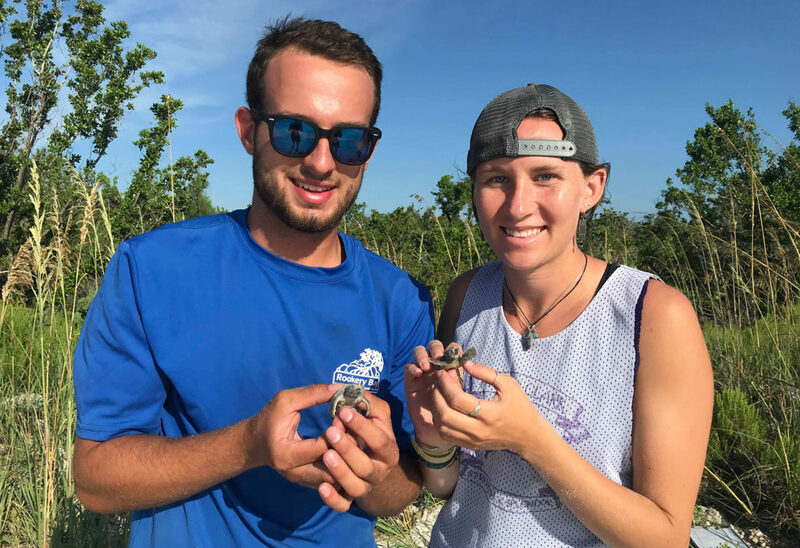 “She joined me for three days of field work and saw our very first hatched nest of the season on the Fourth of July,” says Himmelberger, who also hopes to pursue a graduate degree in GIS from Clark. Three Clark University undergraduates returned to campus after a summer conducting research aimed at protecting endangered species, from the Pacific Arctic to Florida’s Gulf Stream waters. Anthony Himmelberger ’19, Sophie Spiliotopoulos ’20, and Jess Strzempko ’20 received summer research fellowships through the National Oceanic and Atmospheric Administration (NOAA), in collaboration with Clark’s Mosakowski Institute for Public Enterprise and George Perkins Marsh Institute. Below, read more about these Marsh-Mosakowski NOAA Fellows and their experiences. 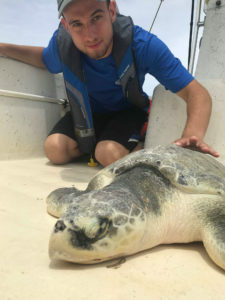 Himmelberger, an environmental science major, interned at the Rookery Bay National Estuarine Research Reserve in Naples, Fla., assessing loggerhead sea turtle nesting along the Cape Romano beaches. Every morning, Himmelberger, another intern, and two volunteers would patrol around seven islands in Rookery Bay. One would drive the boat while another walked about 4.5 miles of beach looking for sea turtle tracks. “This experience, more than anything, solidified my love of field work,” says Anthony Himmelberger ’19. Thanks to the GIS (geographic information systems) experience he’s gained at Clark, Himmelberger felt prepared to use such applications in the field. The experience has helped Himmelberger figure out what he wants to do after graduation. To learn more about Himmelberger’s experience, read the Rookery Bay Research Reserve interns’ blog. 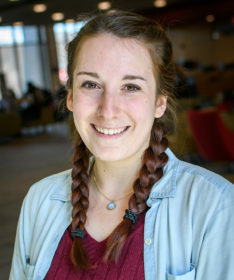 Spiliotopoulos, a geography major, worked in Silver Spring, Md., on a project titled “Identifying and Summarizing Research: Marine Mammal Life History Traits.” She researched the “life history” traits — such as diet, habitat, and migration patterns — of marine mammal species in the Pacific Arctic region. Sophie Spiliotopoulos ’20 interned in Silver Spring, Md. Spiliotopoulos came to the internship well-prepared with skills she had acquired in a research methods and design class. “I was already quite used to reading long, dense academic articles for our final project, so that made the transition into my everyday work a little easier,” she says. She learned about the Arctic by taking classes with Karen Frey, associate professor of geography, an expert on polar climate change who was appointed by the National Academy of Sciences to serve on the Marine Working Group of the International Arctic Science Committee The IASC is a non-governmental, international scientific organization that encourages and facilitates collaboration on Arctic research. In her summer internship, Spiliotopoulos learned more about how climate change is affecting Arctic marine mammals. The internship has led Spiliotopoulos to realize she would like to pursue the fifth-year master’s degree in GIS at Clark. 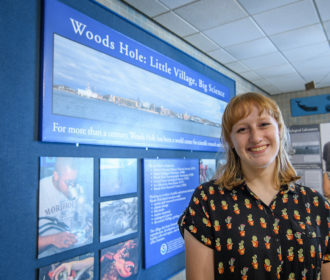 Strzempko, an environmental science major, interned for the Atlantic Salmon Ecosystems Research Team under Ruth Haas-Castro, a research fishery biologist at the NOAA Northeast Fisheries Science Center in Woods Hole, Mass. While most of Strzempko’s days were spent in the Image Analysis Lab mounting, imaging, ageing, and measuring Atlantic salmon smolt scales using microscopes and software programs, she had opportunities to escape the lab. “I got to go on a tour of the Vineyard Sound on a research vessel, the Gloria Michelle, and attend several conferences/workshops at the (University of Rhode Island) Bay campus in Narragansett, which included the summer conference for the southern New England chapter of the American Fisheries Society and a NOAA CoastWatch satellite data course,” she says. Her internship experience showed Strzempko what it’s like to work as a research scientist, and allowed her to obtain professional and career advice from experts in the fisheries industry. Although her internship is over, Strzempko is still connecting what she did this summer to what she is doing at Clark.